Welcome to Wow Us Wednesdays! Have I told y'all lately how talented you are? Well, you are. It is so hard choosing just a few to feature, but here they are. This cute vintage spring window dressing is by An Extraordinary Day. 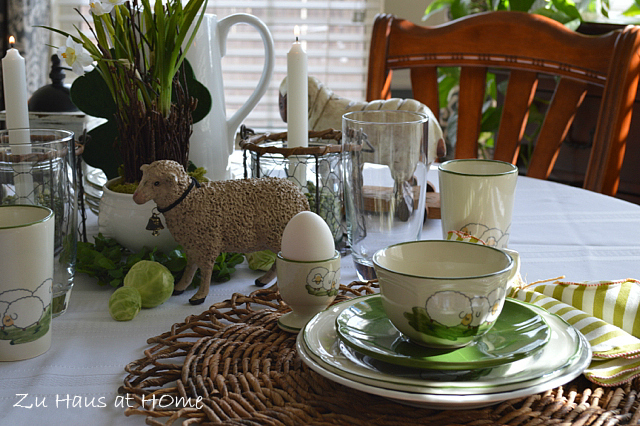 Zuhaus At Home shares her pretty spring table. Great farm house hutch by Dreaming in Color. 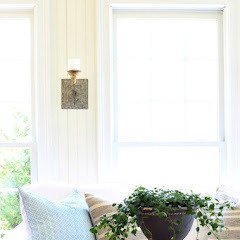 I love this gallery wall reading nook by a new to me Atlanta area blogger The Houston House. 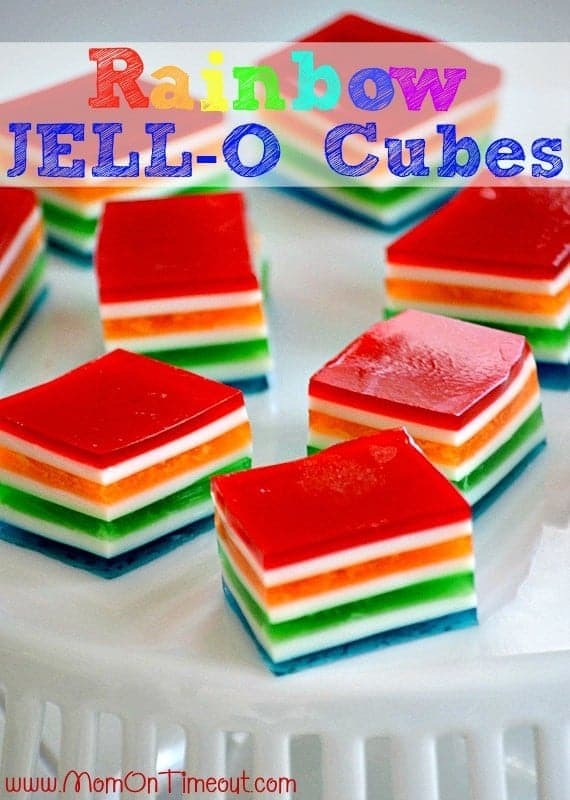 Mom on Time Out shares these rainbow jello cubes. Thanks to everyone who joined the party last week. If you were featured I hope you will grab a featured button from my sidebar. Thank you so much for hosting! I am off to look at the links! Hi Kim, I love your varied features... I'm sure it is horribly hard to share just a few. 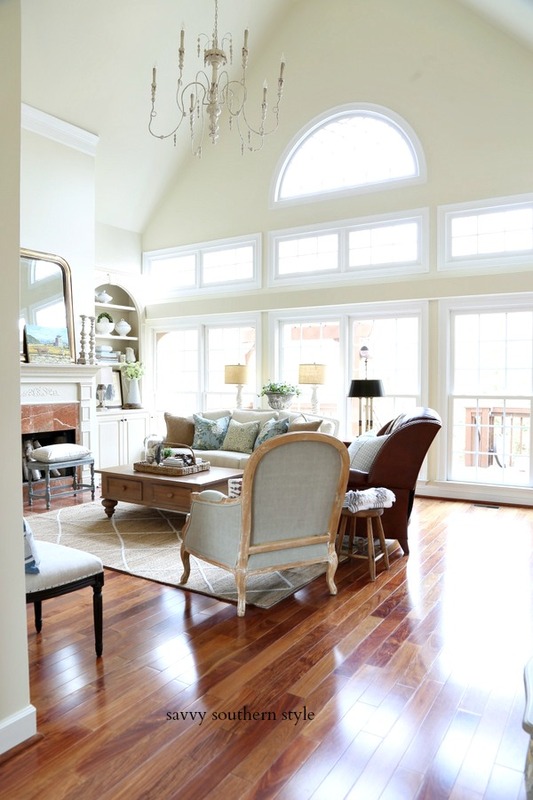 Love the blue and white living room from Starfish Cottage. Beautiful features! Yes, I love Starfish Cottage too. Thanks for hosting! Loved all the features...yes, it must be so difficult to choose from so many great links to your party...so many beautiful rooms, projects and recipes! Thanks for hosting and have a wonderful week! love that gallery wall, thanks for having us, Kim! I love that gallery wall and my girls will love those rainbow jello cubes! Hope you're having a great night Kim! The features look great, Kim. I can't wait to check them out, and mingle with this week's party-goers. Great features Kim! Thanks for hosting, there is so much inspiration! Great features, Kim. And yes, there is a LOT of talent out there! Thanks for hosting! Kim~ So much inspiration each week! Thanks for hosting! So many amazing features! Thanks for hosting Kim! Such cute picks! Thanks for throwing the party! 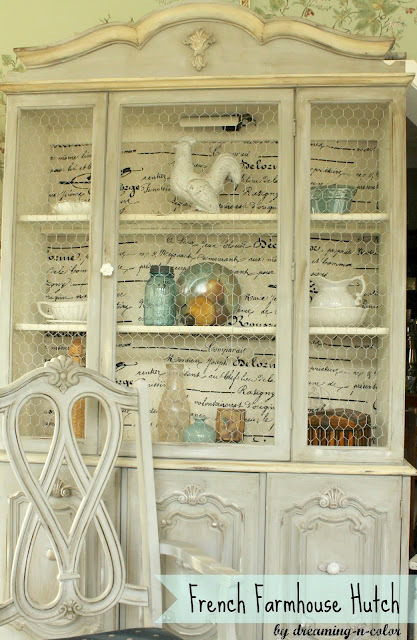 Oooooh chicken wire hutch, love! Thanks for hosting! I'm always amazed at the talented ladies of blog land. Those features are extraordinary! Thanks for hosting Kim. Wow - I can't believe how fast your links fill up! I started at 8:01 and there were already almost 100 links! As always, thank you for hosting. Kim, thank you so much for featuring my Spring Table, what a fun surprise! Thanks for hosting Kim, have a wonderful week ahead! I can't believe how fast your links fill up either - popular party!!! Love that first bedroom! Thanks for hosting Kim! Thanks so much for hosting, Kim! Loved the features! Have a wonderful week. Thanks for the party, Kim! I'm off to visit some of the links! Hi Kim! Thanks so much for hosting! Great features! Super features, I absolutely adore that Farmhouse Hutch! Love all the features Kim! and then ZING, that jello. How fun :) Thanks for hosting! Thanks so much for hosting Kim! You ALWAYS have the best parties! So excited to be featured here tonight! Thank you so much for the party Kim! Thanks for hosting, Kim!! Always a wonderful party with so many lovely ideas! Loving all the posts that are linked up. Thank you for hosting. 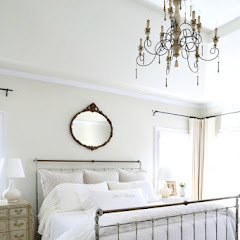 Wow such super features this week!I love Iesha's bedroom redo...so soft and pretty. Thank you so much for hosting and wishing you a wonderful week! Thanks so much for hosting! Have a great week. Thank you Kim for hosting! Thanks for hosting Kim!! Hope you are having a great week! Hi Kim. Thanks so much for featuring my cozy bedroom. I always enjoy your parties! 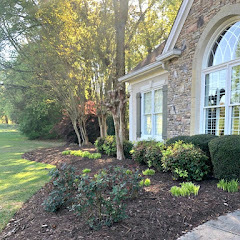 I always look forward to seeing what you feature each week! Thanks for hosting, Kim! Hi Kim, Thanks so much for hosting! Great features! I'm going to head over and check them out. Thanks for hosting and I hope you're having a great week! Thanks for hosting, Kim. I'm curious if you've been to Avec Moi in Franklin? 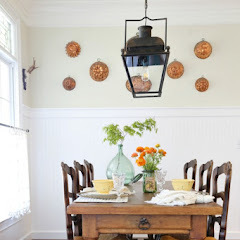 Kim I was honored to see that you featured my farmhouse Hutch!Thank you! 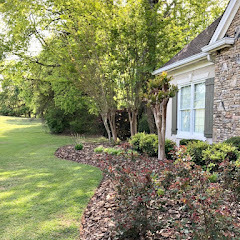 I have always enjoyed linking up to your blog and appreciate all you do to keep it beautiful! Have a wonderful week! Hi Kim - I have put your Wow us Wednesdays button in my post twice and inklinz still won't let me add my post to the party. If you have any suggestions, i am open! Thanks for hosting such a great party. Wow! Such great features this week, Kim. I don't know how you choose! Thanks for throwing such a fun party! thanks so much for all the inspiration!! I'm loving the party, so much to look at, thanks for hosting! Thanks for hosting, Kim! Have a lovely week. Thank you so much for letting come to your party. Thanks for hosting Kim, glad I could join in. Have a good week. Thanks for hosting. You had some great picks this week. Great looking links! Thank you for hosting, Kim! Thanks for hosting Kim, love the gallery wall and so have to stop by Starfish Cottage! Great features, Kim! Thanks so much for hosting. Good morning Kim! Thank you so much for hosting this each week. I love participating and you have the best blog linkers on the web! I always find incredible inspiration here. Thanks for hosting! I see some beautiful work! Thank you for hosting! It's gonna take me forever to look through these, lots of pretty pics this week! Beautiful party Kim...and BIG! Such lovely features too. Thanks for hosting! Beautiful features, Kim! Thank you so much for hosting this great party..so happy to be here! Have a nice day. Kim, thank you for not only hosting such a fabulous party every week, but for having such an inspiring spot to visit! Have a wonderful day! Thanks for the party and the inspiration. Love the features, but the jello just makes me happy! Kim, your link parties are always so amazing. I can't wait to check out some of the link-ups. Thanks for hosting. Hope you're having a great week. Thanks for hosting. Great features too. That rainbow jello looks so yummy! Thanks for the party! What fantastic features! Thanks for hosting! Thank you so much for the fab party! Hi Kim, thank you for hosting! Great blog! Lots of great links this week, Kim! Looking forward to reading a few after school today -- thanks for hosting!